Do you know Post Pals? Vikkie, the founder, contacted Deb on the Cute Card Thursday challenge blog and asked for help to support her noble insitution. Please take the time and visit her homepage. I was touched and will get a card ready today and will make this a regular habbit! Kennt ihr Post Pals? Das ist eine britsche Einrichtung bei der man Karten an totkranke Kinder schicken kann. Durch den Cute Card Thursday challenge blog bin ich heute darauf gestossen, da die Initiatorin von Post Pals um Hilfe gebeten hat. Bitte nehmt euch die Zeit und schaut auf der webseite vorbei. Ich werde heute gleich eine Karte fertig machen und habe mir fest vorgenommen regelmäßig welche zu schicken. This is one of the cards that got published in Scrap Art Zine, a german scrapbooking and cardmaking magazine. 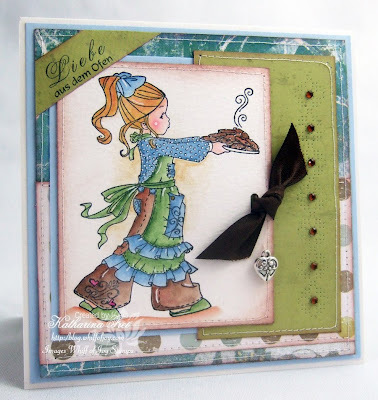 The main image is Willow with cookies from Whiff of Joy Stamps, designed by the lovely Elisabeth Bell. I coloured her with water soluble pens and Twinkling H2Os. I also used one of my piercing templates from Siesta Frames and added tiny crystals to the pierced shapes. The sentiment is designes on the computer and means "Lovin from the oven". Maybe you'll also find the time to participate in this weeks Cute Card Thursday challenge. Das ist eine der Karten, die im deutschen Magazin Scrap Art Zine veröffentlicht wurden. Das freut mich immer riesig :) Verwendet habe ich Willow mit Keksen von Whiff of Joy, designed von Elisabeth Bell. Coloriert habe ich sie mit Aquarellstiften und Twinkling H2Os. Endlich habe ich auch mal wieder eines meiner Piercing templates von Siesta Frames verwendet und dann kleine Kristalle dazugeklebt. Den Text habe ich am Computer erstellt. Vielleicht findet ihr ja auch die Zeit an der dieswöchigen Cute Card Thursday challenge teilzunehmen. What a great card Katherina, love the image and your colour mix is so pretty. Gorgeous card Katharina!! Post Pals sounds great, off to check it out!! Fantastic card Katharina, I love that image, one of my most favourites! Thank you for supporting Post Pals, I too intend to send regularly! way to go hun on being published in the magazine, a fabulous achievment.. whoooop whooop..
love the card looks fantastic! I heard about postpals 2yrs ago and have sent letters and cards, it is a great thing to do. this is a cute card and I love the image very much. cokking. you do not see much of those.